A hydrocyclone is a device to classify, separate or sort particles in a liquid suspension based on the ratio of their centripetal force to fluid resistance. This ratio is high for dense (where separation by density is required) and coarse (where separation by size is required) particles, and low for light and fine particles. 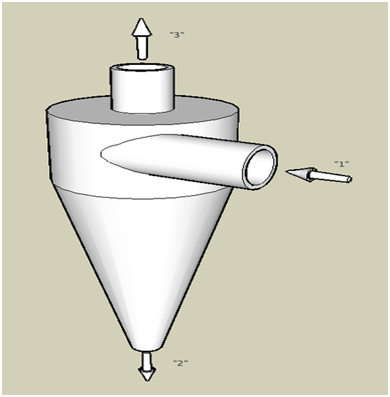 Hydrocyclones also find application in the separation of liquids of different densities. A hydrocyclone has two exits on the axis: the smaller on the bottom (underflow or reject) and a larger at the top (overflow or accept). The underflow is generally the denser or coarser fraction, while the overflow is the lighter or finer fraction. Internally, centrifugal force is countered by the resistance of the liquid, with the effect that larger or denser particles are transported to the wall for eventual exit at the reject side with a limited amount of liquid, while the finer, or less dense particles, remain in the liquid and exit at the overflow side through a tube extending slightly into the body of the cyclone at the centre. Forward hydrocyclones remove particles that are denser than the surrounding fluid, while reverse hydrocyclones remove particles that are less dense than the surrounding fluid. In a reverse hydrocyclone the overflow is at the apex and the underflow at the base. There are also parallel-flow hydrocyclones where both the accept and reject are removed at the apex. Parallel-flow hydrocyclones remove particles that are lighter than the surrounding fluid. Hydrocyclones can be made of metal (mostly steel), ceramic or plastic (such as polyurethane, polypropylene, or other types). Metal or ceramic hydrocyclones are used for situations requiring more strength, or durability in terms of heat or pressure. When there is an occurrence of much abrasion (such as occurs with sand particles) polyurethane performs better than metals or ceramics. Metal lined with polyurethane is used in cases of combined abrasion and high pressure. In a suspension of particles with the same density, a relatively sharp cut can be made. The size at which the particles separate is a function of cyclone diameter, exit dimensions, feed pressure and the relative characteristics of the particles and the liquid. Efficiency of separation is a function of the solids’ concentration: the higher the concentration, the lower the efficiency of separation. There is also a significant difference in suspension density between the base exit (fines) and the apex exit, where there is little liquid flow. If the size range of the particles is limited, but there are differences in density between types of particles, the denser particles will exit preferentially at the apex. The device is therefore a means of selective concentration of, for example, minerals. This device is also related to the centrifuge; both of them are intended to separate heavies and lights in liquid by application of centrifugal force. For a Bradley Hydrocyclone the dimensions of each part are always in the same proportions. The pressure drop should be between 20 psi and 60 psi. The separation efficiency of a hydrocyclone under a particular set of running conditions can be described in terms of the “heavies” concentration in the “lights” outflow as a percentage of the “heavies” loading in the total inflow. Volumetric percentage separation calculations (%v/v) are usually quicker and easier to perform. However, the separation efficiency calculation can also be performed on a mass basis (%w/w). A hydrocyclone is most often used to separate “heavies” from a liquid mixture originating at a centrifugal pump or some other continuous source of pressurized liquid. A hydrocyclone is most likely to be the right choice for processes where “lights” are the greater part of the mixture and where the “heavies” settle fairly easily. Generally, hydrocyclones are used in continuous flow systems so that the instantaneous liquid inflow to the hydrocyclone is equal to the total instantaneous outflow of “lights” plus “heavies”. In cases where “heavies” are a very small part of the whole liquid, it is sometimes advantageous to accumulate them in the bottom of the hydrocyclone for batch wise removal. In pulp and paper mills to remove sand, staples, plastic particles and other contaminants. In the drilling industry to separate sand from the expensive clay that is used for lubrication during the drilling. In industry to separate oil from water or vice versa. In metal working to separate metal particles from cooling liquid. In potato processing plants to recover starch from waste water. In mineral processing, hydrocyclones are used extensively both to classify particles for recirculation in grinding circuits and to differentiate between the economic mineral and gangue. To remove sand and silt particles from irrigation water for drip irrigation purposes. In some applications, hydrocyclones are capable of sharp separations of “heavies” and “lights”. In other situations, they are used for incremental enrichment, reducing the load on other, more costly separation equipment and improving the overall economics of operation. Hydrocyclones are generally not recommended for removing long fibers from liquids.